Vulture at the Wheel When flacks from a car maker ring us, it’s usually to say that their new model goes like the wind, uses next to no fuel or redefines what we understand by “handling”, “braking”, “packaging” or value. When I was offered a loan of the new Audi Mk. 3 TT coupé the push was... the dashboard. Seriously. So just how good does the dash need to be – or how mundane the rest of the car – for that to be the focus of the PR campaign? As it turns out, Audi’s PR people hadn’t actually taken leave of their senses. The Big Idea here is what Audi calls the Virtual Cockpit. This is based around a 12.3-inch, high resolution LCD display that completely fills the driver’s instrument binnacle and replaces the traditional analogue dials. This lets the driver choose between two display modes. In the “classic” view, the speedometer and rev counter are larger while in the “infotainment” mode the two virtual dials are smaller. Below is a short video to show it in action, and yes, I was stationary when I recorded it. The space that becomes free as a result of the dials shrinking provides more room for other functions, such as a huge navigation map that fills almost the entire display – watching the POV of the map in the binnacle alter as you drive around is undeniably cool – or details of the music you are playing. At the lower edge of the virtual cockpit the displays for temperature (outside and engine), time, fuel, mileage and so on, are permanently visible so you don’t have to dig about for basic information. Warning and information symbols are also displayed there. The virtual cockpit is powered by two Nvidia Tegra 3 processors. One, called the MMX (Multi-Media eXtension), is located in the glovebox; it powers the infotainment and navigation functions. 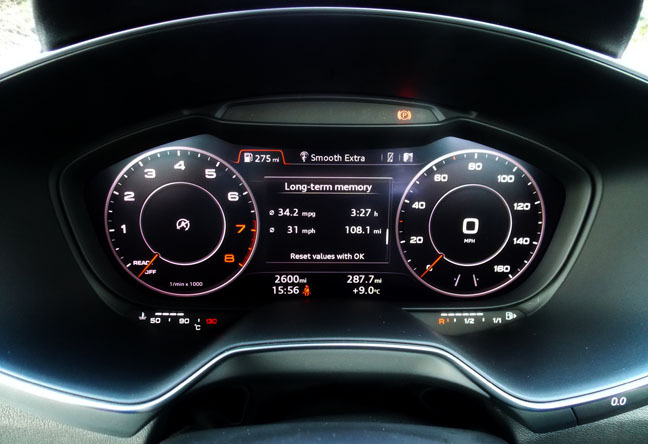 The other is built into the 12.3-inch instrument panel and powers driver information systems, such as the speedometer and tachometer. 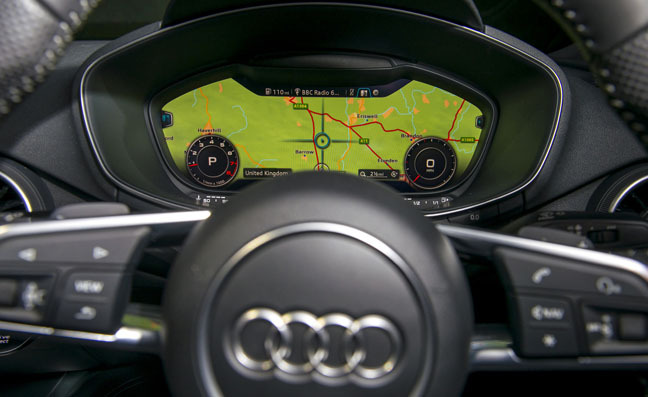 If you add the Technology Package to your TT you can hook it up to the internet though Audi’s Connect service and get Google Maps, Google Street View, traffic information, news headlines, flight and train information. You can also stream music (again, via a bespoke Audi service) and see what’s afoot on Facebook and Twitter.